ComfortableConservatories Orangeries v4. The latest Conservatory Software's new features for the window door & conservatory industry. Can't find the information you are looking for on this page? Click here to ask! Can't wait to try? Click here for the risk-free fully working 14 days free trial! The latest version of ComfortableConservatories contains so many features that its hard to put them all on only one web page! For your convenience we have broken it up in to easy to digest chunks! This page shows the differences in the latest version of ComfortableConservatories over version 3 of the software. The following pages outline what was added to previous versions of the software (which are all included as standard in the latest version). ComfortableConservatories has been enhanced again with many fundamental, intuitive, and time-saving features. Below and over the next series of pages you will learn of the key new options that make ComfortableConservatories with Orangeries a remarkably clever upgrade. 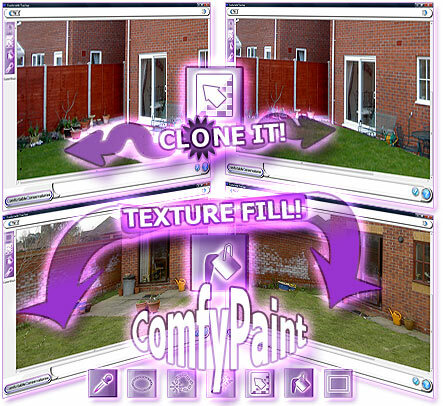 Integrated 'ComfyPaint', for "touching up" property photos. This valuable new tool helps you to touch up and tidy up, property photos, before you complete the conservatory overlay process. The 'Clone' tool which allows you to select an elliptical area of a photo and clone it to other parts of the same photo. Fantastic for painting grass or other items over debris in the garden! Rectangle, Ellipse, polygon & Magic Wand tools, for selecting virtually any area of the photo to copy or to fill. A Make Brush feature which lets you make a brush from either a texture area or spot colour from the customers photo. The Fill tool enables you to fill a selection on-screen with a brush made with the 'Make Brush' feature above. Copy & Paste features let you copy a selected part of a photo and then paste the selection to another location within the photo. An undo feature, to reverse changes made to the photo. ComfyPaint is a perfect partner to ComfortableConservatories established features. The Comfortable Surface Designer. For driveways, patios, decking, walls and more! That's right! You can create Driveways, patios, decking, Extra Walls and more with the Comfortable Surface Designer! This valuable feature, provides a huge boost to what can be displayed on-screen, on a photo ..in 3D! With its amazing, powerful options you can show and sell products and services, other than the conservatory. With its astounding set of 3D capabilities you can display countless home improvement extras, it really does amaze! Driveways - Design the shape(s), choose the look(s) and more! Patios - Design the shape(s), choose the look(s), build it in alongside your conservatory and more! Walls - Design the shape(s), choose the look(s), show it with the conservatory and more! Above are only a few examples of what can be created. This new addition to the program has limitless potential, using its significant range of tools and your imagination, we are sure all kinds of wonderful landscaping is possible. Surface Designer scenes can be saved with the quote or order and can be re-edited at any point. All Surface Designer scenes can be viewed in all their "photo-realistic" glory, in the 3D view! Surface Designer scenes can be saved with the quote or order and can be re-edited at any point. All Surface Designer scenes can be viewed in all their "photo-realistic" glory, in the 3D view! The redesigned report section allows users to group reports in to different categories and re-name them to suit. Grouped and sub-grouped reports provide a more logical structure, allowing you to find the required report quickly and with ease. For example, the new "Line Drawings" report group contains separate "A4" & "A3" size sub-groups, each of which contain the relevant sizes of CAD drawings. Report Groups - Group reports in their own folders and sub-folders. 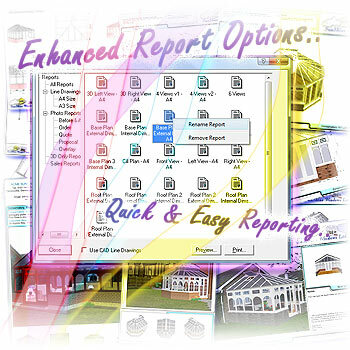 Report Renaming - Reports can be renamed to the customers requirements. Sales Report Pack - A new default 'Sales Pack' group of reports. Print Multiple Reports "in one go" - You can now send an entire report group to the printer. Report Removal - Reports that are not required can be removed by the user. ComfortableConservatories comes with pre-configured report groups for your convenience, which you can still change to suit, if required. 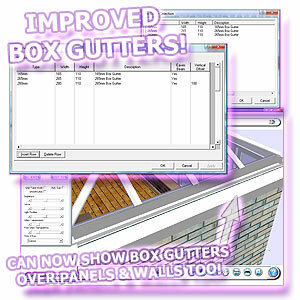 Add Extra Box Gutter Sizes - The user can now specify their own, additional Box gutter sizes. Remove Box Gutters - User can re-configure or remove existing Box Gutters. Box Gutter Over Wall - Box gutters can now be shown over walls. Box Gutter Over Panels - Box gutters can now be shown over panels. Any changes made to the box gutters are shown on the 3D view. When you add box gutters they are stored for future use, so you only need add them once! 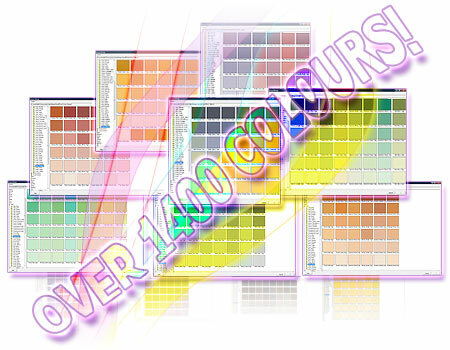 Over 1400 Dulux® colours included! Includes over 1400 Dulux® colours. This version of ComfortableConservatories sports over one thousand digital versions of the current Dulux® colour range, all of which are available within the internal wall folder. Calm - Blues, Golds, Greens, Neutrals, Oranges, Reds, violets and yellows. Fresh - Blues, Golds, Greens, Neutrals, Oranges, Reds, violets and yellows. Rich - Blues, Golds, Greens, Neutrals, Oranges, Reds, violets and yellows. Warm - Blues, Golds, Greens, Neutrals, Oranges, Reds, violets and yellows. Classic - Classic whites, Edwardian & Art Deco, Georgian and Victorian. Contemporary Looks - Easy Living, Modern Comforts, Natures Touch and Urban. 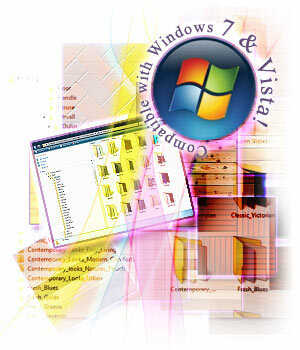 Windows® VISTA & Windows® 7 compatibilty, improved folder structure and more! *New* Windows® 7 compatibility - ComfortableConservatories v4 is the only ComfortableConservatories package that will work with this new operating system. Works with 32bit and 64bit versions. Windows® VISTA compatibility (All VISTA versions) - ComfortableConservatories v4 is the only ComfortableConservatories package that will work with this operating system. Works with all current 32bit and 64bit versions. Sub folders - Images can now be grouped in to a more logical folder structure and the software will remember where you selected an image from when re-loading a quote or an order. E.g. You now have an "IntWall" folder that contains "Dulux", "Mixed interiors" and "Wood Interiors". The "Dulux" folder has further sub-folders for each colour range, making it quick & easy to locate the required colour. Decking Folder - Contains example decking images for the new Comfortable Surface designer. Driveways Folder - Contains example driveway images for the new Comfortable Surface designer. Many other tweaks and benefits have been added to the system, including: Desktop shortcuts to the house photo and company logo folders, additional guides, system optimisations and more! To find out the new features introduced in ComfortableConservatories version 3, please click the next button.